The Amish Shaker 2-door Hutch has a stunning 2-shelf glass display top, with 2 dovetailed fully extending drawers and ample storage space hidden behind its 2 handcrafted, hardwood doors. 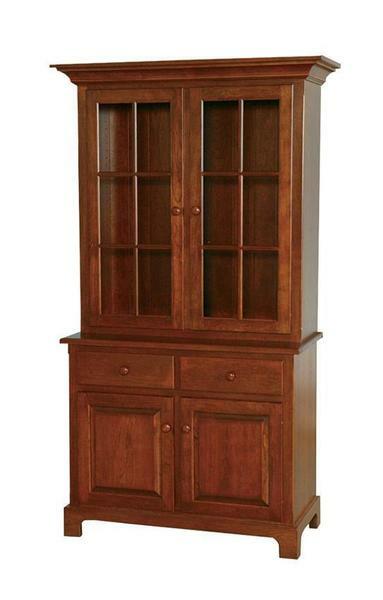 This beautiful Amish hutch features modern luxuries such as touch lighting, and soft close drawer slides. Mirror back and silverware drawer inserts are also available. By concentrating on form and function, the Shaker style has become a highly recognizable and timeless style. Use these custom options to create a piece that is truly perfect for your home and needs. The final product of your custom Amish Shaker style hutch will be an heirloom quality piece of American made furniture that you will be proud to own as part of your home furniture collection. If you have any questions or need custom ordering assistance, please don't hesitate to call and speak to one of our friendly and knowledgeable Amish furniture specialists.